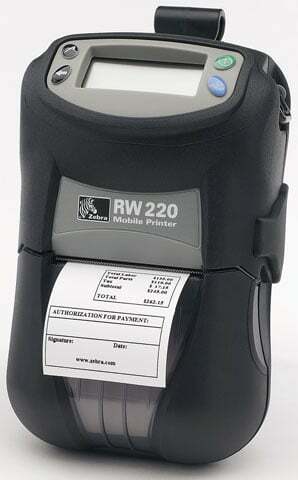 Designed for the Road Warrior, the RW 220 mobile receipt printer is ideal for printing delivery receipts and invoices on the go. The modular design allows users to choose among wireless options, card readers, and integral accessories such as a vehicle mount for simplified route printing. Easy-access vehicle mounting cradles and charging options as well as user-intuitive interfaces and angled displays enhance the convenience and simplicity of mobile printing. Uniquely designed for harsh outdoor environments, RW 220 mobile printers endure extreme temperatures and weather conditions. Bounce it in the truck, carry it in the rain, drop it on the pavement, and expect the same performance day in and day out. Running Charger, Lithium Ion, AC. power supply for the QL Plus and RW series. The Zebra R2D-0UGA010N-00 is also known as ZEB-R2D-0UGA010N-00	or R2D0UGA010N00	.